SINGAPORE - The Malay/Muslim community has made enormous progress in the past 50 years, and can be proud of its achievements, especially in helping to build a cohesive multi-racial society, Prime Minister Lee Hsien Loong said on Sunday. Speaking in Malay at the start of his National Day Rally, Mr Lee lauded the community's growth and its efforts in nation-building. "The Malay/Muslim community is an integral part of Singapore. You have contributed significantly to our nation's harmony and progress," he said. "The Government appreciates the community's contributions and strong support. Let us continue the strong co-operation we have established over the years. Let us continue to write the Singapore story by strengthening our harmonious, multi-racial society ." The community has much to be proud of today. Malays are represented in every part of Singapore society, he said, adding: "Nowadays, when we look for promising professionals to field as candidates, we find many successful Malays in many different fields: lawyers, bankers, educators, engineers, SAF officers." The community has successfully built a culture of self-reliance, while maintaining the spirit of "gotong royong", the Prime Minister said. It rallied together, setting up self-help groups such as Mendaki and the Association of Muslim Professionals. The Government, meanwhile, has supported strongly the community's progress by providing resources and advice, and offering the leadership of Malay/Muslim ministers and MPs. Mr Lee announced that madrasahs, for instance, will get a boost when it comes to the teaching of secular subjects, such as mathematics and science. He pledged the Government will work with the Islamic Council of Singapore, or Muis, to strengthen the teaching of these subjects. It will also provide financial support to upgrade teachers of these subjects, and fund awards for students who do well in them. "It's important for our religious scholars and leaders to have a good grounding in non-religious subjects," said Mr Lee. "It prepares them to guide Singapore Muslims to live in a modern, technological society." 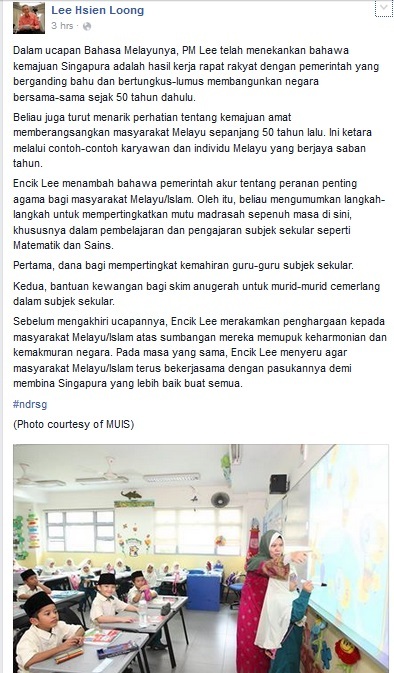 While the Government will help with secular subjects, it will leave religious education in the hands of Muis and the community. Mr Lee said he was happy to see that the standards have improved, especially with the joint madrasah system, which unites some of the full-time madrasahs here under a single system. The Malay community as a whole has also benefitted equally from national policies in areas such as housing, education and healthcare, he added. The public housing programme has enabled more than 90 per cent of Housing Board dwellers to own their flats. A small group, however, still live in rental public flats. "Within this group, Malays are over-represented," he said. "Many of them are young Malay families with marital and financial problems, he added. "I am concerned about their future, especially that of their children. They may be trapped in poverty. Their children will be affected too." He said: "We should help these families start afresh if they are determined to put their lives in order... We should help them own flats once again, to provide their children with a more stable environment." Mr Lee also paid tribute to veterans in the community such as master potter Iskandar Jalil, who received a Meritorious Service Medal, and former Senior Minister of State Sidek Saniff, who spoke at the funeral of Singapore's founding prime minister Lee Kuan Yew. Mr Sidek started off opposing a few Government policies but in the end still called the late Mr Lee a friend. "Mr Lee succeeded in building an inclusive, multi-racial society as he promised from the beginning . Fifty years on, I am touched and proud to see many Malays, especially the young, expressing heartfelt love for Singapore openly," Mr Lee said. "They appreciate and uphold our multi-racial society." This article was first published on August 23, 2015.